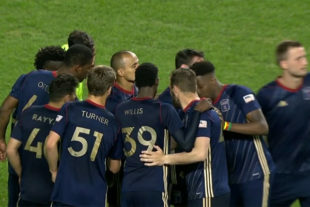 For the first time in club history, Bethlehem Steel FC defeated the Charleston Battery Saturday night at Talen Energy Stadium 3-1. Union striker Kacper Przybylko scored a brace with goals in the 43rd and 70th minutes, and Fabinho, debuting for Bethlehem as captain and left back in place of the suspended Matt Real, scored a penalty in the 66th. Charleston central midfielder Tah Anunga scored unassisted from the edge of the penalty area in the 69th. Bethlehem fans are learning that sustained possessions do not happen under Ernst Tanner’s new system. While Bethlehem is credited in the official statistics with the slightest of possession advantages, the game was end to end, a series of rushes roughly in the fashion of ice hockey. Only at the end of the match did Charleston have periods of sustained attacking in the Bethlehem defensive third. Anunga’s return from missing the previous two Battery games had a clear impact on play. His age, athleticism, and experience frequently disrupted Steel attempts to attack through the central channel with short passing. He would just manage to disrupt or intercept at the ends of promising sequences. Aside from Anunga, midfield play on balance favored the Steel. Each side had pace advantages in the attack. Zeiko Lewis for Charleston almost scored straight down route one in the fourth minute. After that near disaster, he stayed fairly well controlled until he shifted out to the wing late in the match. In the helter-skelter play at the end of the match he had two separate significant chances that he missed rather than having been defended successfully by Bethlehem. Faris at the end of a bull rush. The same should be said for Faris and Michee Ngalina. Faris has the speed, strength and technical skill to defeat multiple defenders. He needs to keep his head up at the ends of these bull rushes to find the pass rather than focusing on his own shot. When he learns to judge well when to do each, he will be devastating. Ngalina simply has pace and control. Battery head coach Mike Anheuser started former Bethlehem man A. J. Paterson in his best attempt to control the Congolese, but particularly when Ngalina was in combination with Issa Rayyan, Charleston’s outside left defensive channel was vulnerable. At the very beginning of the second half, Rayyan delivered a perfect cross, after he and Ngalina had combined yet again, that found Przybylko unmarked in the box. Unfortunately, the tall German headed his easiest chance of the night over the top. There is little question that Bethlehem caught a break when Charleston striker and leading scorer Ian Sventesson went off with a lower leg injury in the 13th minute. Nonetheless, the final result was just as Bethlehem took some of their chances. Charleston did not. Bethlehem now lie 5th in the Eastern Conference table with ten points from three wins and a draw. The squad next travels to Charlotte, NC for a match against the Independence on Tuesday, April 16 at 7 p.m. It is the quickest turn-around of the season. Philadelphia Union head coach Jim Curtin commented last Wednesday that it might be an opportunity for some of his reserves to get a game. Defend the goal? : A picture is worth a thousand words. Bethlehem Alumni: Santi Moar scored a natural hat trick in the first half for New Mexico against Real Monarchs. Attendance: The official claim is 1,003. It was the first warm night, and certainly the parking lot was more full. There seemed to be at least two youth teams in attendance. Bethlehem: Carlos Miguel Coronel*; Fabinho ©(Walter Cortes 83’), Ben Ofeimu, Cole Turner^, Issa Rayyan; James Chambers, Chavany Willis; Zach Zandi, Michee Ngalina; Kacper Przybylko*(Shanyder Borgelin 72’), Faris (Saed Diaz 88’). Unused Substitutes: Kris Shakes^;, Steve Kingue, Jack DeVries^, ,. The Rest: Out – Jamoi Topey, Questionable – Selmir Misic, Inactive, registration paperwork presumed – Yomi Scintu. *=Union player ^=Academy player. Charleston: Joe Kuzminsky; Leland Archer, A. J. Paterson (Romario Piggott 74’), Taylor Mueller ©, O’Brien Woodbine; Jared von Shaik, Tah Anunga; Nicol Rittmeyer, Zeiko Lewis, Angelo Kelly (Dante Marini 83’); Ian Svantesson (Arthur Bosua 16’). Unused Substitutes: Phil Breno; Kyle Nelson, Vinceno Candela, Kotaro Higashi, ,. Thank you for the summary and observations, Tim. Excellent point. Should’ve said “age-related experience” to get the “age” in there. I had not made the calculation at the time of writing, but even with Fabinho and Przybylko joining Chambers, the average squad age weighted by minutes played was still 22.5. The kids are beginning to show that on a good day they can compete well.